The Splatoon Global Testfire was a free Splatoon demo available on the Nintendo eShop for Wii U. It allowed players to engage in free four-versus-four Turf War battles at scheduled times ahead of the release of the game. It was available for download before the scheduled times, but server connection was not possible beforehand. The application was made unavailable for download afterwards. It was eventually succeeded by the Splatoon Testfire demo. The Splatoon Global Testfire briefly returned from 21 August 2015 to 23 August 2015 for Wii U owners that had not yet purchased Splatoon. The Testfire also returned for Splatoon 2. During the Global Testfire, players were able to customize their Inklings and enter a tutorial area where they could pop balloons and get accustomed to the game's controls. They were then able to enter online matches of Turf War and use the Splattershot Jr., Splattershot, Splat Roller, and Splat Charger on both Saltspray Rig and Walleye Warehouse. Promotional image of the pre-purchase gear. Players were given the option to pre-purchase Splatoon at various points in the Testfire demo. Players who pre-purchased were awarded special gear to use for the remainder of the event. The gear was only cosmetically different from the gear that regular players had access to, and had the same abilities. This gear did not carry over into the full version of the game. Pre-purchase players were given Studio Headphones with Ink Recovery Up, a shirt that resembles Zink Layered LS with a team-colored squid design and Quick Respawn, and Red Hi-Horses with Special Saver. Promotional image for the event. During the Testfire, real-life members of the Squid Research Lab participated in battles, appearing in-game as Inklings with special research gear. The gear was only cosmetically different from the gear that regular players had access to, and had the same abilities. 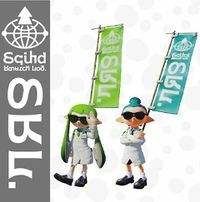 Squid Research Lab gear featured a set of dark sunglasses with Ink Recovery Up, a lab coat with a large banner attached in the team color and Quick Respawn, and a pair of black dress shoes with white socks and Special Saver. In order to ensure a sufficient number of players for the Testfire, Nintendo designated the following times to be used. The title screen before pre-purchase. The title screen after pre-purchase. The message given when the Testfire servers are offline. The background for Testfire screens. A still from the Splatoon Nintendo Direct announcing the Splatoon Global Testfire. Screenshot of a researcher in-game. The members of the Squid Research Lab wearing similar attire. The Global Testfire application did not create any save data. Players who received pre-purchase gear lost it after closing the software. When the servers were shut down, players online were given the message: "A communications error occurred." They were then taken back to the title screen. However, if they were in the practice area when the servers were shut down, they were not brought back to the title screen and could stay in the area as long as they wanted. The digital manual for the Global Testfire application was the full game's manual. ?SUP000 for the pre-purchase gear (includes alternate versions of Studio Headphones and Red Hi-Horses). ?SUP001 for the Squid Research Lab gear. 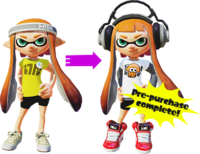 In Splatoon 2, gear items Studio Octophones and Octo Layered LS were granted to players who pre-purchased the Octo Expansion DLC. This is a reference to the pre-purchase gear from the original Splatoon Global Testfire. Kansei Hirō Shishakai The Rollout Presentation and Testfire Ceremony. A pun of 試射 shisha, testfire and 試写会 shishakai, movie preview. ↑ "Happy Monday, Squids! It’s come to our attention..." Live from Squid Research Station. 17 August 2015. Web. 17 August 2015. ↑ Whitehead, Thomas. "Splatoon Global Testfire Suffers Major Problems in Final Pre-Launch Session." Nintendo Life. Gamer Network, 23 May 2015. Web. 23 May 2015. This page was last edited on 8 April 2019, at 10:17. This page has been accessed 22,198 times.